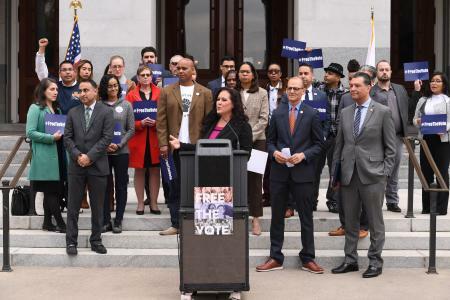 SACRAMENTO–California Assemblywoman Lorena Gonzalez (D – San Diego) joined Assemblymember Kevin McCarty Monday on the West Steps of the Capitol to announce a campaign to restore the right to vote for people who served their time but are on parole. In California, a person’s right to vote is suspended when they are incarcerated or on parole for a felony conviction. As a result, approximately 48,600 Californians on parole are unable to vote in state, federal, or local elections. Sponsored by California Secretary of State Alex Padilla and jointly authored by Assemblymembers Kevin McCarty, Shirley Weber, Rob Bonta, Lorena Gonzalez, Ash Kalra, and Sydney Kamlager-Dove, Assembly Constitutional Amendment 6 is known as the Free the Vote Act and is the first step in eliminating this barrier to the ballot. Nationwide, there are an estimated six million Americans that are unable to vote because of felony disenfranchisement. Formerly incarcerated people on parole are working, paying taxes, and raising their families in our communities. However because of a conviction, they are excluded from participating in the democratic voting process. In addition, excluding people on parole from the right to vote is counterproductive to what public safety demands – that returning citizens should be civically engaged and responsible civilians. A prohibition on voting strips these people of a fundamental right, disproportionally impacts people of color, and undermines the goals of re-entry. “On the other side of a prison sentence, we want people invested in their communities. Because civic participation is linked to reduced recidivism, this bill will facilitate reintegration for parolees,” said Assemblymember Shirley Weber (D-San Diego). “One of every 13 African Americans cannot vote due to being on probation or parole, versus one in every 56 non-black voters,” said Assemblymember Sydney Kamlager-Dove (D-Los Angeles). “I’m proud to co-author ACA 6. After paying their debt to society, people have a right and obligation to contribute to society. Part of building a productive life includes becoming civically engaged and exercising the fundamental right to vote,” said Assemblymember Rob Bonta (D-Oakland). “I saw firsthand the genuine and successful rehabilitation of former offenders while serving as a deputy public defender for 11 years. ACA 6 is critical in reforming parole voting restrictions, which disproportionately impacts people of color,” said Assemblymember Ash Kalra (D-San Jose). Furthermore, a survey conducted by Initiate Justice in 2018 of more than 1,000 people in prison and on parole in California found that more than 76% of respondents on parole believed that voting would help them stay out of jail and feel more connected to their communities.